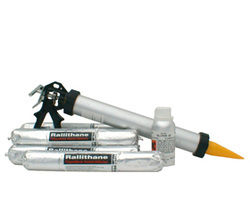 Rallithane 850 is manufactured to meet with performance requirement of BS4254. It is designed to seal wide range of joint including masonry, concrete, aluminum stone cladding, floor expansion joint etc. Rallithane 850 does not have significant "Staining Effect" on Granite, Marble and most type of natural stones. Mortar EJ/CJ, Stone Cladding Joint, Curtain wall panel, Pavement, Window Parameter. Metal, Coatings, Cementitious, Glass, Ceramic and Most types of construction materials and material stone etc.